Provide useful baseline information that can be used to track a variety of potential impacts - such as non-point source pollutants can flow from the land into creeks including sediment, synthetic materials from our roads and automobiles, fertilizers, nutrients, sewage leaks, and animal wastes - that can stress aquatic systems and impair their beneficial functions. Youth Stream Teams participate in watershed assessments, restoration plantings, natural history hikes, public presentations, and surveys. Teams meet individually, and as an all-school group throughout the year. Meetings take place in an outdoor setting. Youth Stream Team students also map runoff areas on their campus, test storm water runoff, and learn about land use practices that can potentially cause water pollution and solutions for preventing urban runoff. Meetings include pre/post classroom activities maintaining links to classroom content. Youth Stream Teams are formed from Middle/High, and Juvenile Court schools throughout Butte County. the program serves as a "mechanism to inform youngsters of the ecological functions of the Creek, potential impacts to the Creek, and ways to protect the Creek." 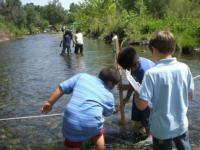 proper use of equipment and common protocols used to assess stream health. overview of common restoration practices and site-specific planting techniques including pre-post monitoring methods. an overview of the ecology, and cultural relevance of the Big Chico Creek Watershed. Supplies needed for Stream Team activities are provided.